Okay, I cheated a little bit with panel four, but I was buried in work this weekend, and had to take a shortcut to be ready in time. It happens. I’m going to try to update the vote incentive art this week, so throw a few votes my way and keep an eye out! 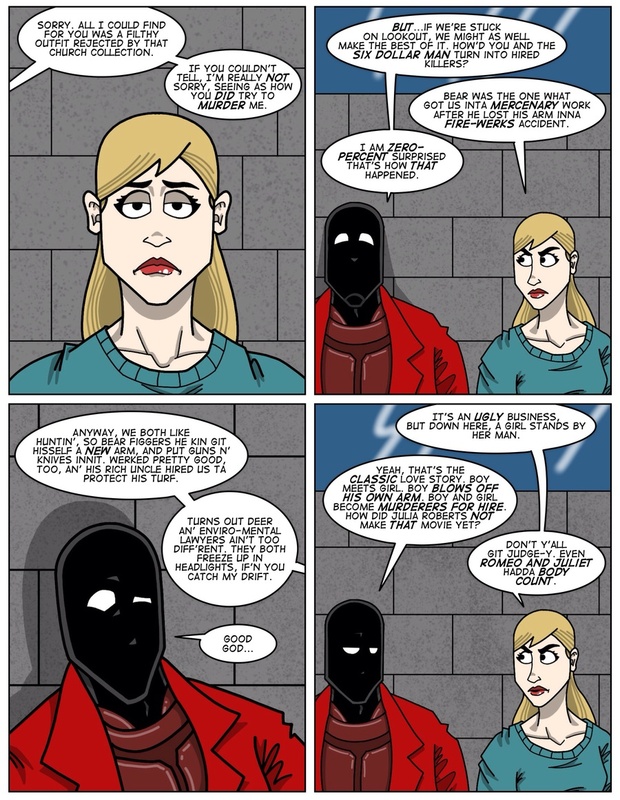 You can leave comments by clicking here, leave a trackback at http://supervillainous.spiderforest.com/comic/love-story/trackback/ or subscibe to the RSS Comments Feed for this post. She’s not wrong about the Romeo and Juliet thing. The body count did include themselves, but she’s still not wrong. Look, she isn’t wrong. It’s not exactly an inspiring backstory but she isn’t wrong. (It scares me that my first impulse was to go back, reread all the tragedies and then plot them from highest to lowest bodycount. What do you bet that some young Literary post-grad did precisely that for his PHD? o_O). I have to agree with you there. That play makes the Red Wedding look like any actually wedding. It’s been a while, but from memory there are five significant deaths in Romeo and Juliet… the title characters, plus Mercutio, Tybalt, and Paris. and none of all y’all dithering about body counts had the brain cells to note she was not only referencing Romeo and Juliet. (scary to think that scenario still happens and was enough of a thing to do a play about) But, I digress. As I was saying, she is also losing the accent…poor city boys. Such suckers always thinking folk like her ain’t educated. Okay, I chuckled at “Six Dollar Man”. I think that was just cheap. Cheap, you say? Like, maybe 6 dollars?